U.S. Federal Court Judge Dana Christensen has ruled in favor of environmental groups and Native American tribes that challenged the U.S. 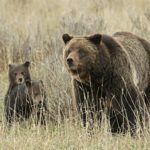 Fish and Wildlife Service’s 2017 decision to remove Endangered Species Act protection for Yellowstone area grizzly bears. The decision will prevent grizzly bear hunts from going forward in Wyoming and Idaho. Christensen’s opinion was circulated around 5 p.m. Monday. “The decision just came in like 10 minutes ago,” Earthjustice attorney Tim Preso said. Featured grizzly image by Keith Wright.